Convertible pants are among those products that are both hated and loved with the same fervor. The idea of pants that you can turn into short should be treasured by everyone, but sadly their styles sometimes leave much to be desired. However, the best convertible pants are not just a fashion trend, they are useful garment items which can facilitate your life when hiking or doing outdoor activities. If you are reading this article you must have certainly decided (or at least be thinking about it) to go with convertible pants for your next outdoor excursion. If you haven’t, we recommend you to read our article about choosing the right outdoor pants which might help you form a decision. But for those who did, choosing among so many options can be hard, so we are here to make your selection of the top-rated convertible pants a lot easier. Let’s start with a definition. What are they? The convertible pants are outdoor pants (usually) in which you can remove their bottom part to transform them into shorter length ones or into shorts. You do this by unzipping them apart. The wonderful thing about convertible pants is that they will allow you a greater level of versatility than normal outdoor pants, because you can change them into shorts if the weather gets too warm and vice versa. The reason people sometimes don’t like them has to do with their style, which can get a bit old fashioned, and also they can get uncomfortable if they don’t fit right or the zipper gets in a wrong place. Still, everyday new convertible pants get launched into the market, and there are so many different options you can choose from, that can balance good features for backpacking and hiking as well as with an attractive style, and good cost. To help you gain that balance with your gear, we have collected some characteristics we consider you should review before buying a product. Buying a wrong size can make those zippers get uncomfortable, so making sure they have a good, relaxed fit is a good start. The fitting should be tight enough in the waist for the pants to be secured, but loose enough around the knee area to ensure you will not get hurt by the zippers when doing active things, like rock climbing. 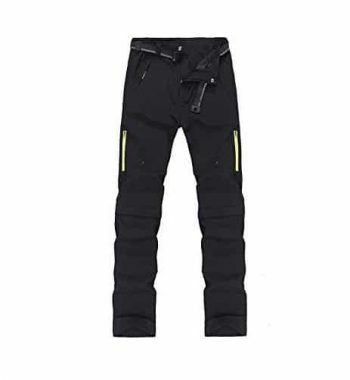 Even thought there are many convertible pants that have protection in their zippers, a good fit will also allow you to move around freely and will make your gear last longer. When you are exposed to the sun and warm weather, as well as when doing active events during cooler ones, you will inevitably sweat. That is why, you must make sure that the fabric of your pants of choice is breathable enough to avoid overheating your body, and help the sweat dry so you won’t get sick or worse. Even when it comes to convertible ones that you might simply turn them into shorts if you get too hot, your crotch area will still be covered by the fabric and not letting it breath will surely make your hiking experience worse. Having protection from the sun is one of those features that worth the extra money it might take, because it will help in the long run. Not only to prevent things like skin cancer, but also having UV lights repelled by the garment can help the clothing stay cooler and lessen the sweating if combined with a breathable fabric. However, sun protection might be more necessary for some people than others, like those who do many activities under direct sun exposure or higher elevation, so think about this when deciding if it is a needed feature in your clothing. This is one of the characteristics you should definitively look for in an outdoor item. Since these pants are usually faced with elements that normal clothing will not, the clothing should be able to last and resist it. Whether it is facing rocks or difficult landscapes that can scratch and tear it, to just a hard weather like wind that can debilitate your fabric, the item should be prepared. So make sure you read a lot of reviews about this fact, and also consider the kind of use they will have. If you are giving them a hard outdoor use, you should consider buying pants with an abrasion resistance that makes them tear and hole less easy. Not only this will help your trip, but it will also help your pocket, as sometimes investing in more expensive items that would last more is better than cheaper ones that will have to be replaced sooner. This is another feature that will surely turn out to be useful, but that depending on the use the pants will have, might not be a deal breaker. 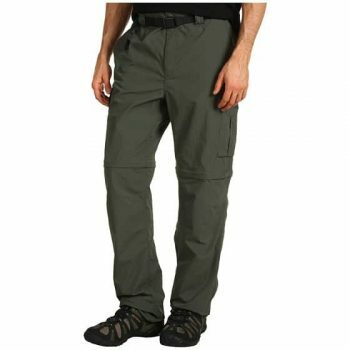 Having water or moist repellent finish is very useful for those water related activities like fishing or beach sports, but it can also help you in those cases of long backpacking trips where you have to carry the less weight possible because they won’t get wet easily, and if they do they will usually dry faster than other pants. This means you will not have to wait too long to be able to wear them again, and also that you can shorten the number of items needed for a trip. If you are planning on taking a trip to somewhere dry and hot, moist repellent fabrics sometimes have the asset of absorbing sweat and making you stay dry more easily, which is not a bad thing to have. With this one, it really comes down to your preferences. Some people like having pants with lots of pockets to store things, some others prefer just one or two. One might love Velcro for securing them, while others might feel safer having a zipper. It is up to what you like. Just remember that the number of pockets or some extra features it might have, will probably influence in their cost. As I mentioned before, is not the same thing to buy a convertible pant for hot dry weather, than to buy one for water activities, or to but one for light outdoor use and for rock climbing and extreme sports. The characteristics of what you are looking for should be aligned with the intended usage for the pants. Lastly, but not less important, the cost is an important thing to compare against the handling the pants will get. Sometimes if the use will be harder than average the cost will be an investment, and you should make sure to get the greatest durability and features you can get for its price. But, if your plan is a lot less heavy, going for cheaper options, with fewer features can be the right thing to do. With that in mind, why we have reviewed some popular convertible pants with their pros and cons, and hopefully you can make a more certain decision with it, and pick the best convertible pants for you. 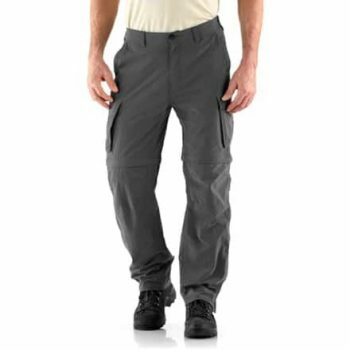 Columbia Silver Ridge Convertible Pants are a great option for hiking, making your luggage smaller because they are very versatile. You can wear these pants as shorts and go for a sunny expedition, or use the full inseam pants and have some protection against the wind. The great thing about these pants is that they have UVA and UVB sun protection, blocking the light and making them really great for long excursions under the sun. They are very lightweight and comfortable due to the Nylon material, but they are no less durable and wind-protected as many other outdoor pants. This helps if you are hiking in a cooler weather. What stands this product among others is its evaporation technology, which allows sweat to be absorbed by the fabric, and since they are easy to dry, it lets you stay warm and dry. As many other Columbia pants, this one comes with a belt to help you with fitting, and it has rear Velcro pockets and also has a zipper pocket to help keeps important things safe. One thing you should consider with these pants is the sizing, which might vary depending on your measurements and preferences, but keep in mind that these are around a 34 inseam. If you ask us, the best thing about REI Co-op Classic Sahara Pants would definitively be the no sit-zipper. Who hasn’t got their pants dirty by having to pull the fabric under the shoes? This is a great option for a quicker and overall easier conversion. Also, this makes it easier to change when you are in a difficult landscape or carrying heavy backpacks for long treks and can’t afford to sit down and change. Another great thing about the pants is that they are water repellent. These make them a fantastic option for water related activities, and since they are quickly to dry, you will not gave to stay wet and cold. Their 50 UVP sun protection allows you to be secure as well under the sun. Helpful for long walks under sunny weather and deserted landscapes when you are not protected from the sun. At least you’ll make sure your legs will. One thing people might not like about the pants is their cost, but if you want to have quality items, you should know it might cost you a little. Look at it as an investment in yourself. When you are looking for an item that will last for a very long time, making sure that it is abrasion resistant is a good start. The North Face Paramount Peak li Pants are made of abrasion resistant nylon, which means that they are comfortable and lightweight as well as durable and resistant. This is a great thing if you are planning on going rock climbing or any activity where clothing can be damaged. Other than that, it also helps you protect yourself from harms, as your body is less exposed to the elements. If you mix this with its durable water repellent finish, that allows avoid moist and helps dry faster if wet, you can use these pants for your next excursion without worrying too much about weather. Only thing could be improved is sun protection, but even pockets are large enough for keeping your important things safe with you. You can find Prana Stretch Zion Pants in two versions depending on your preference, the roll-up version and the convertible one. The pants are made out of 97% Nylon and a 3% Spandex, which allows for a comfortable and right fit to your body, which is just right when you are faced with long travels and trekking, and even rock climbing. The fabric is both thick but breathable, so it will help you during both cooler to warmer weather. Due to its abrasion repellent feature, you can make sure that no matter how comfortable, they can still protect your body against hard conditions and landscapes, as well as last a lot. It is also water repellent, and has a quick dry fabric that shortens the waiting drying time. This feature is useful for those excursions to unpredictable weather, and also helps you lessen the amount of clothing you will need, which is perfect for backpacking trips. On the downside, these pants can get a bit expensive, but with all its features they are worth the price you pay. 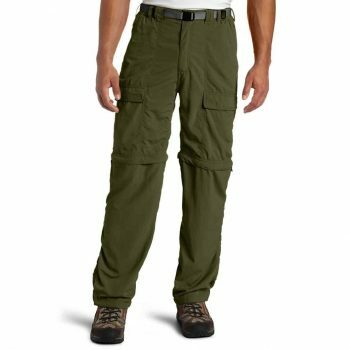 One of the most useful features about White Sierra Trail Inseam Pants are the vertical side zippers on the cuffs, that allow you to convert them more easily. They don’t go all the way up to the convertible zipper, but allow for you to broad the cuff to facilitate it. Another great thing is their rip-and-stick adjustment tabs, also on the cuffs, which will help you on those muddy situations when you are on a hurry or don’t want/ can’t convert your pants into shorts. They are water repellent as well, so you can use them in water related activities, for the beach and rivers, and they will also dry pretty easily, allowing you to use them again shortly after. Also a great option for sunny weather when you might sweat a lot, so your pants or shorts can dry a lot easier and keep you warm enough. And given their UPF 30 sun protection against UV light, you don’t have to worry about harming your skin. You should consider that these pants, although durable, are not meant for hard environmental conditions, but for lighter hiking scenarios. 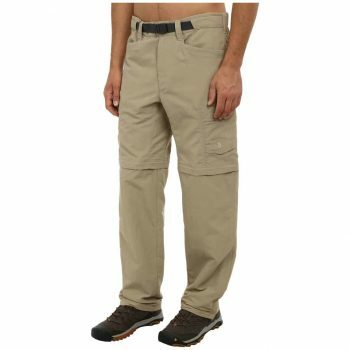 Geval Convertible Pants are a good and very affordable option for outdoor pants for traveling or light hiking, but they are especially designed for summer and spring outdoor activities. Their Omni-Shade 40+ UPF sun protection offers a good feature for those same activities under the sun, without having to worry about the sun exposure or overheating. The fabric used for these pants is 100% nylon that makes them lightweight and comfortable as well as very easy to dry, so you won’t worry about getting wet, and again makes them perfect for the beach or water-related activities. Lastly, they have some great pocket space with zipper to keep your things secured while you are doing your activities. The issue you might face with the ordering is the sizing, because it is not the same one Amazon has, so you will have to be careful and use measurements to order the right one instead of choosing by size. 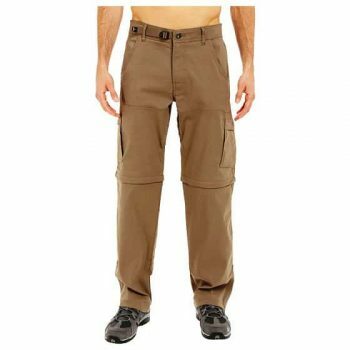 Stream Convertible Pants are perfect option for backpacking, since they dry really quickly, are very easy to wash and can be carried easily because they can be folded into a small volume. This way you don’t have to carry many items with you. They are really lightweight and comfortable, and have a very modern look to them, which makes them great for daily wear as well as outdoor activities. The pants come with six pockets, each secured by a zipper, so you can make sure to carry your important things with you. Like the previous one, you have to look at the size chart to get the measurements right, since it is a Chinese size and it is different than the US size chart. 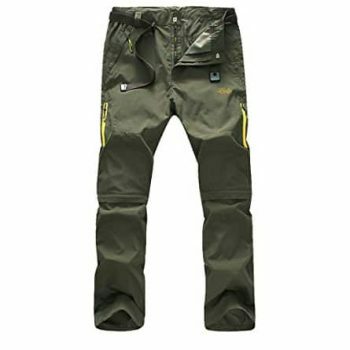 Choosing outdoor pants can be a difficult task, and even more so if you are buying them online. You have to keep in mind things like a good fit, good material, its features and style, and decide the use they are going to have, to be able to choose accordingly. Deciding if you’ll be using them for hard outdoor activities or some lighter ones can make a difference when investing your money, since those difficult outdoor activities often require more features, which leads to higher price. We hope that the reviews we made of the products can help a little bit more with the decision making, and that you end up investing your money right. Do you like convertible pants for outdoor activities? If so, what features do you prefer in them? Let us know in the comments below!